Perhaps it was the conversation about time’s existential implications or about our city’s burgeoning food truck culture or about what in the world was dotting the floor of the gallery, the opening reception of Metronome at whitespace gallery was certainly abuzz with excitement. Featuring artist Michele Schuff’s series of encaustic paintings (please see previous entry for more detail), guests were introduced to her most recent works using three-dimensional cast forms. Schuff captures the invisible process of time through the use of repetitive heat-fused brush strokes and forms, suggesting the metronome as a metaphor for the meditative beat of life’s fleeting moments. 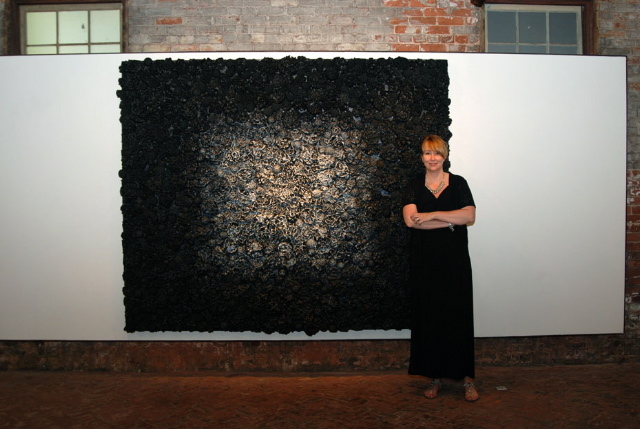 Artist Michele Schuff in front of her piece Big Blue. 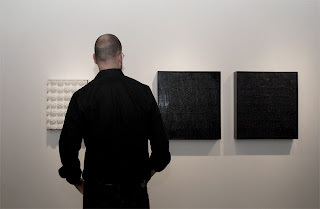 A visitor studies Michele Schuff’s encaustic works. In support, alliance, and promotion of Atlanta’s food truck community, whitespace’s reception for Metronome also welcomed King of Pops, Rattletrap Coffee Truck, and Sugar Coated Radical (SCR). King of Pops came through to cool us down with his specialty pops while Rattletrap kicked it up a notch with some icey caffeinated goodness (and refreshing home made lemonade). The radicals of SCR set up their mobile candy shop to deliver an array of revolutionary sweets, not to mention plenty of sugar coated samples. Visitors using the QR code to find more information about Michele Schuff and her work. 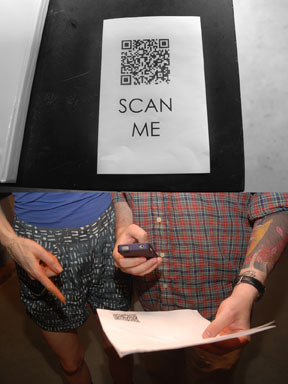 Metronome is the also the first show to launch the use of Quick Response (QR) codes in the gallery. QR codes have been installed throughout the gallery, enabling viewers to access exclusive artist related content on their mobile devices. Metronome’s codes feature unreleased photo sets of Michele’s works in various states of creation. Laid on foam core, the codes can be found slightly raised off the floor near pieces: 48squares, Big Blue, Oushak, and Reprise. Additional information on QR codes can be found at the gallery’s front desk. Come by and check it out for yourself! This entry was posted in Encaustic Painting, King of Pops, Metronome, Michele Schuff, QR Code, Rattletrap, Sugar Coated Radical on June 22, 2011 by Whitespace.